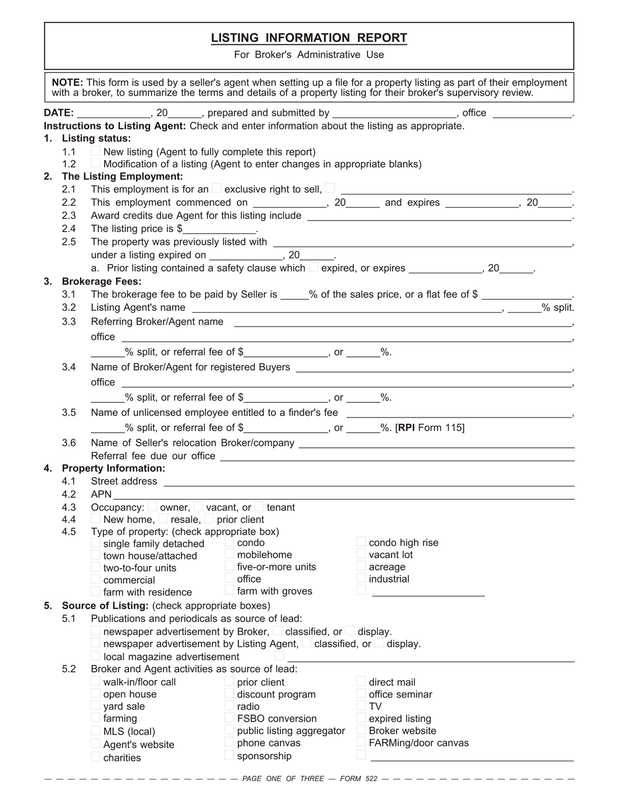 This form is used by a seller’s agent when setting up a file for a property listing as part of their employment with a broker, to summarize the terms and details of a property listing for their broker’s supervisory review. An agent employed by a broker solicits members of the public to retain them as their agent to render real estate services. With a little perseverance, the agent encounters owners who enter into listings employing the agent’s broker to locate buyers and sell their properties. The agent then markets the property and locates a buyer. Soon, a transaction closes. The broker, and in turn the agent, receive an earned fee — the primary motivation for becoming a sales agent. From the first solicitation of a client to receiving the fee on a closed transaction, massive amounts of data are gathered, received and sifted by the agent. The agent further coordinates and documents numerous events related to the transaction. Without listing reports from the agent detailing their activity, the broker is unaware of all the conduct taking place on their behalf — from the agent’s solicitation of employment to the receipt of a fee on a closed transaction. provide critical support for marketing the property. The listing report is the listing agent’s first critical delivery of unified information on the employment to their broker. To be most effective for all parties, the listing report is to be completed by the agent and delivered to and reviewed by the broker before marketing the property to locate buyers. The agent who obtained the listing becomes the individual in the broker’s office who is initially responsible to the broker for the care and maintenance of the client’s file. On entering into a listing employment, the agent sets up a physical client file to house information and documentation on all activity which arises within the broker’s office due to the existence of the employment. The client file contains any paperwork, notes, billings, correspondence, email printouts, fax transmissions, disclosure sheets, worksheets, advertising copy, copies of offers/counteroffers and rejections and all other related documentation. Thus, everything that occurs as a result of the client employment is centrally retained in the client file to be reviewed by the broker. The Listing Information Report — published by RPI (Realty Publications, Inc.) — is used by the seller’s agent when setting up a file on listing a property for sale. On it, the agent summarizes the terms of the employment and details of the property for their broker’s supervisory review. The client file belongs to the broker, not the seller’s agent. However, it will likely remain with the listing agent the sale is closed or the listing expires un-renewed. The agent hands the broker the entire file on the close of escrow. Delivery of the file with the agent’s final closing report is usually a condition precedent to payment of the agent’s share of the fee received by the broker. The broker or office manager periodically reviews the file as a supervisory requirement. Initially on taking a listing and on employment modifications, the filled-out Listing Information Report, along with other pertinent forms and documentation, is thoroughly reviewed by the broker. When the file is closed out by the agent, the report provides the broker or manager with all the information necessary to distribute fee splits and referral fees. Checklists belong in the file and are used by the agent. They are reviewed periodically by the agent, office manager, TC or employing broker for oversight and to determine future tasks needed to better service the listing and earn a fee. Article: Brokerage Reminder: CalBRE audits – are you prepared?